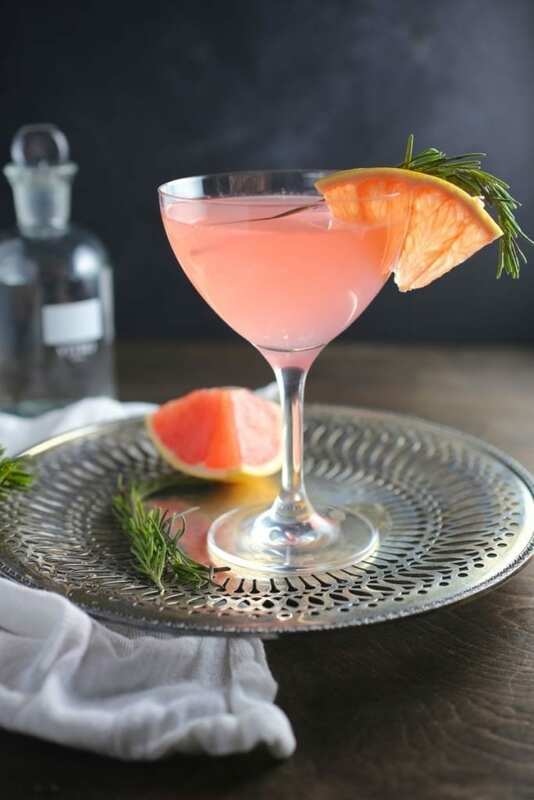 This vodka, grapefruit and rosemary cocktail is tarted up with St Germain elderflower liqueur and has a refreshing, herby taste perfect for cocktail hour. One of my favorite words of all time is the French word for grapefruit: Pamplemousse. I also love that it’s a pretty effective insult in French, meaning an annoying, pesky, person who is immature. And of course, it also means boobies. So many uses! Of course the best use for un pamplemousse, as it is for most citrus in my opinion, is to juice that thang and mix it with some spirits. In this case vodka and elderflower liqueur. St. Germain with fresh grapefruit is one of my all-time favorite cocktail combinations. While too much of the elderflower liqueur can be cloying, a hint of the sweet floral note is just right with the slightly bitter tang of the citrus. The name “French Tart” is a play on our other cocktail, the French Blonde (or Red Head), in which we add gin and Lillet, but I wanted to do something different here. 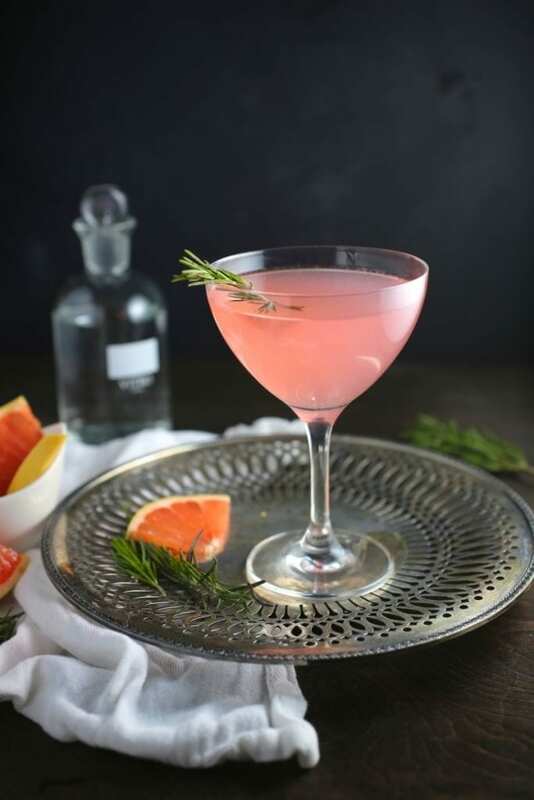 Poking around online, I found a grapefruit and rosemary cocktail called The Romarin (served at a restaurant called Le Diplomate), which combines elderflower and grapefruit with vodka and rosemary syrup and decided I had to try it. I added a little lemon juice to tart things up a bit more and it’s so good! I hope you like it as much as I do. Rosemary syrup may sound odd but it’s incredibly tasty. Matt and I have made it for years to add to cocktails or as non-alcohol option mixed with club soda. I especially love it combined with lime but now I love it with grapefruit too. Store it in a clean jar in the refrigerator and it will last for weeks. 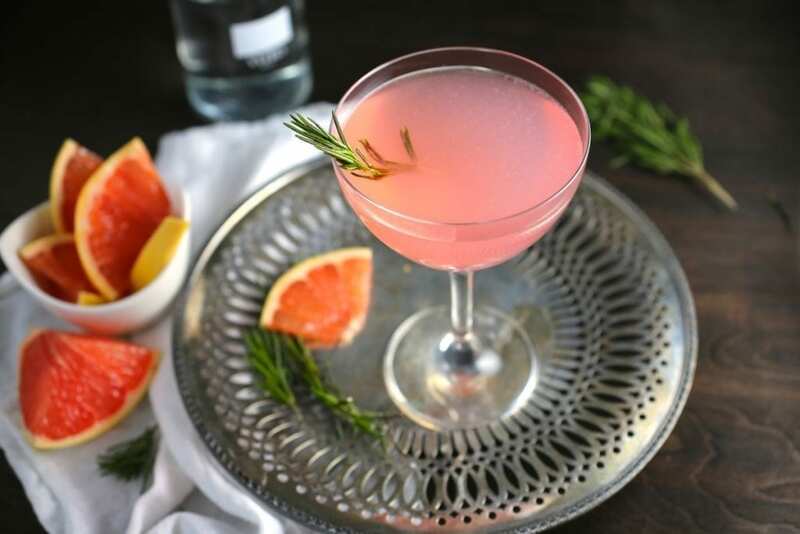 We hope you’ll add our grapefruit and rosemary cocktail to your repertoire. Invite us over! *For the rosemary syrup, add two medium sprigs of fresh rosemary along with 1 cup sugar and 1 cup water to a small saucepan. Bring to simmer and stir until sugar dissolves. Turn off heat and allow it to steep for 30 minutes until it cools. Remove rosemary and store in an airtight jar in refrigerator. In a mixing glass three-quarters filled with ice, combine all liquid ingredients. Stir until chilled, about 30 seconds. Strain into a chilled coupe glass. 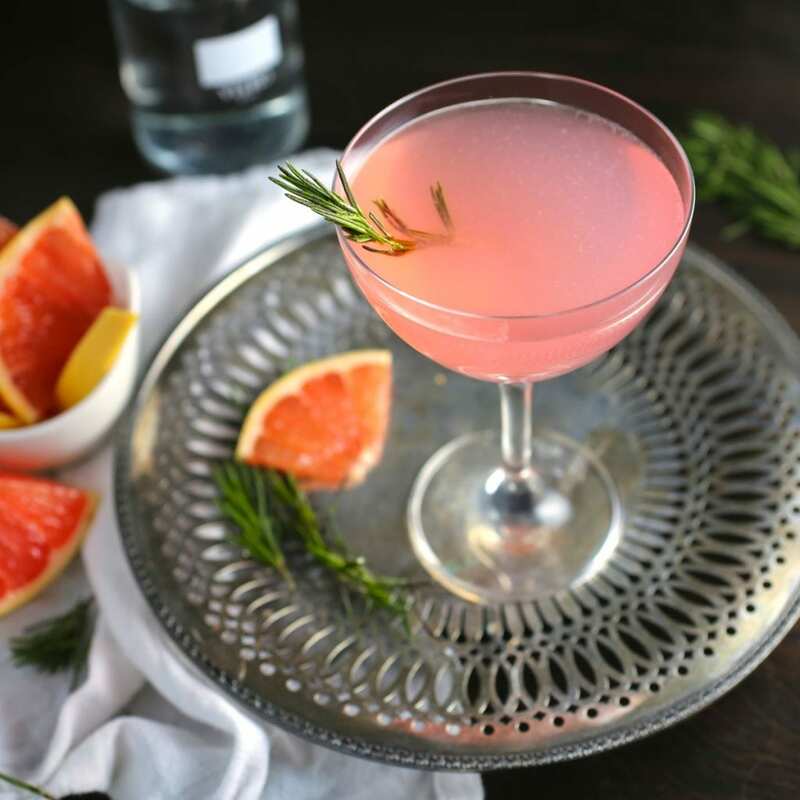 Garnish with a small slice of grapefruit or rosemary sprig. I love that word too! And champignon, which sounds like a thoroughbred. Lovely cocktail. Pinned! I love everything about this cocktail! The name, the rosemary and the colour! will def try it at our next dinner party! Thanks Kiki! I hope you like it if you give it a try! I can’t tell you how yummy this drink is! If you do not care for grapefruit, you should still give it a try, the grapefruit flavor is not strong. Thanks for the recipe!